My first port of call had intended to be Jim Kirkpatrick at The Tap but, given the distance and the fact that I was walking and, given the Tap's compact performance arena, I was unlikely to get any decent photos. I decided that it was impractical. Jim usually draws a crowd. So, after dropping my excess crap off, grabbing some fodder, I set off for the unlit crypt that is The Young Pretender. So, after moving back to town, from a year of living in Munich, I went out to places, did things and, stuff. It's all their fault. Blame them!ve made no secret of the fact that I don't like this place, as a live music venue, as it is. I applaud the sentiment but the performers as re in a backlit goldfish bowl with no lights. The audience never stops talking whilst the artists play, and it has all the warmth of a tomb. They do sell good, if expensive, beer though. Personal bitching aside, it's always a pleasure to pop back and see these two fine gentleman. I attribute my connection to the local music scene to a distant, hazy recollection of seeing them at The White Lion, aeons ago. It stirred me into action, to get involved in a scene that had passed me by for the previous fifteen years of living in the town. For the first decade and a half of 'living in Congleton' I mostly worked away, coming back for weekends or, late in the evenings. When you're gone by 7am each morning and don't get back until 8pm, you know every single noise the car makes but little about what goes on in your own house, never mind what's going on in town. So, after moving back to town, from a year of living in Munich, I went out to places, did things and, stuff. It's all their fault. Blame them! See, this is what makes them different in my eyes. So many singer-songwriters fall back into playing 'the songs you always love to hear' and, as good as some of them are, they do nothing with them, just do their best to copy the famous version. I understand the psychology of it all (it's the same with Classic Rock Radio logic) but: Damn it all to the bowels of Bloody Hell! If the music is good and the performer has passion, 'they' will listen and may hear something they hadn't heard before, and like it. That's what I love about Phil and Nick. They perform great songs and they do it bloody well. Isn't that why you go and see live music? What more can you ask for? It was over all too soon, though. Tempus fugit, and all… I caught just the first two songs from Dougie Francis, and what I heard sounded good. I'd go and see him again. However, I had to go and catch another offering. No rest for the wicked and, for me, that meant schlepping right across town to Quigley's. Well, the one thing that has really surprised me is the state of Congleton Town Centre… Did someone misplace it? Is this a Cheshire Least 'we didn't sell it, we just can't find it!' situation? Dashed careless, if you ask me, Piglet. I recently discovered that the second album was pretty damn good, as well. Some great little blues numbers on there, and a few fine moments on it, too, even a more funky feel at times. Well worth investing in both CDs. But, how would a third of their normal live outfit fare as a trio? After all, they'd never actually done this before. And, in a swanky wine bar, too, with some weird hobo pointing a camera at them? Tune in next time, for the next instalment of Hobo With A Camera! Just as I needn't have fretted about whether Better Start Cookin' would be any good, they need not have worried about the show. There were a few times, at the beginnings of songs, where there were looks between each of them, finding their space and rhythm, as a trio, and then, when it clicked, they were off to the races. And, you know what, at times, I think they even surprised themselves about how well it was going. It was all over their faces when they were having fun and grooving along like bad boys. I thought their performance was astonishing, both individually, and as a band. Spot on, chaps! ​This was just the kind of thing you hope to see at these small music festivals. You rarely get to the see a whole set from an act. You catch bits, here and there, like sampler LPs, back in the day. And, more often than you probably deserve, you get to see something really good happen in a small, intimate venue. I spoke to a few people afterwards, who had seen the set from Chris, Scott, and Dave and, although they hadn't know much about them before, by the end of their set they had been wondering about buying a CD. “Well worth the price of two large lattes,” I advised them. Saturday was always going to be tough: the travel, the crappy trains, the uncomfortable buses, the walking thing, the crappy buses, but I manfully struggled on. To The Piano Bar, to see a couple of guys I knew nothing about, Incredible Planet. That's also the joy of small music festivals; you go and see artists just because you can. I'll give it a try, thought I.
I was expecting nothing, and knew not what to expect. Hey, from my point of view, if they didn't show or, weren't that good, I'd just wander up to Quigley's for Skutch Manos. Their set-up time was quite long but, fair dos, they brought a couple of LED lights, which made all the difference from where I was standing. When a turn begins to play, I always wait until after the third song until I make a decision. Sound issues, light issues, PA issues, all take a song or two to shake out. Then there are the questions: Where to take photos from? What is the lighting like? Where is the best view? Can I get through the audience? Should I leave before I cause myself some work? By the third song I was well taken with these two. Darren's easy patter and rapport get the audience involved in what's going on. They make the best of not looking like a Boy Band by using striking lighting. They look interesting. The more you watch and listen you then start to think, Hey! these two really know what they are doing. They're a bit good. I won't claim to be able to remember what they played. Can't even tell you one of 'em. They did a Tears for Fears one… Some covers? If they did, they did them in such a way that they made them their own. I wasn't paying attention to that. I was watching them perform. Whilst Darren is the front man that you can relate to, Kevin is a bit of a dark horse. He just stands there quietly and then you suddenly realise that he is a really good guitar player. And then, the creative type inside me kicked in and I just enjoyed taking pictures of them, whilst they played some great music. They looked interesting. I loved them. Highly recommended! For some reason, I can't find any proof that I have ever seen Skutch Manos before. I was sure I had, a couple of years ago. Skutch Manos offer a beautiful and hypnotic clash of classical Spanish and British instrumental acoustic folk, sometimes heavy, sometimes soft, but always heartfelt. Think Rodrigo y Gabriela, John Williams, Ozric Tentacles, John Mclaughlin, and Led Zeppelin, all rolled in to one; a deadly and rhythmic combination of percussion, guitar, and double bass. Skutch Manos was formed, in 2011, by classical guitarist Arlen Connelly (formerly The Acoustic Conquistador) and Brazilian percussionist Holly Prest, after meeting as different acts at Manchester’s popular Food and Drink Festival. The band soon became 3, in 2012, with the addition of jazz double bassist Grant Russell and have found hard followers from music hot spots such as, Band on the Wall, ans Matt and Phreds. Their compositions are often dynamically expansive and well embellished and best served live! I did that cause I have no idea how to describe Skutch Manos to someone else. I have no point of reference. I'd add a bit of John Butler to the above list, above, too. 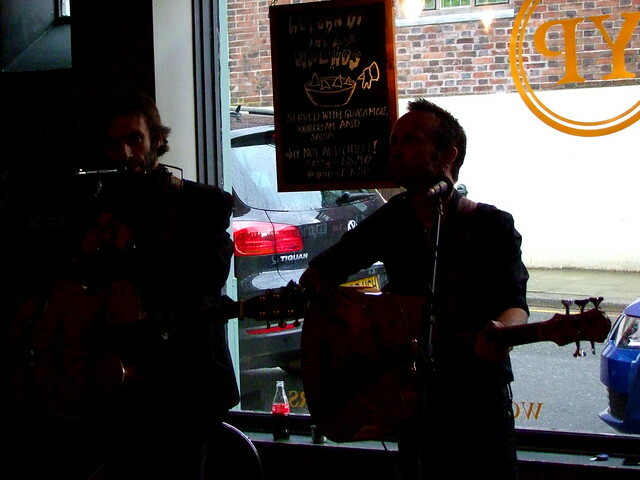 What we saw at Congleton Unplugged was guitarist, Arlen, and Percussionist, Holly. If you were expecting anything other than a classical guitarist, accompanied by a Brazilian Percussionist, playing [music in the style of] rock songs, acoustically, Boy!were you in the wrong place. I can't really describe this as being to the taste of the majority of punters, normally, unless that's the reason they were already there. Not, that Skutch Manos is bad; they're accomplished musicians and very good at what they do. But, I can figure that some people just won't get it. Personally, I liked it. For me, from what I've seen, Arlen, exhibits characteristics I hear in John McLaughlin, John Butler, and a bit Dave Matthewsy at times, at others a bit Flamenco, and there's some really complicated stuff in there. It's quite impressive to watch. I'd really like to see them as a three-piece (if I haven't already!). I have to say that the sound lacked the double bass, that insistent rhythm that this kind of music needs wasn't there. Maybe I was just achy and cranky. I'd really like to hear more of their stuff and see them live, properly (if I haven't already! ).